This little tin of cuticle cream has received many rave reviews. I'd just like to give my two cents' worth on it as I've been using it fairly regularly for the past eight months. I'm now on to my second tin. I received my first one, a travel-size tin (0.30oz / 8.5g) in a swap with my dear friend, Danielle, last year when Burt's Bees hadn't made its debut in the Netherlands yet (a limited selection of its products are now available). Give your needy nails a helping hand. Nourish and moisturise nails and cuticles with this intensive, natural treatment. A touch of lemon oil makes your nails smell incredibly clean, and healthy, naturally. Gently massage crème into cuticles after washing hands and as needed. Sweet almond oil, Beeswax, Lemon peel oil, Cocoa seed butter, Candelilla wax, Beta-carotene, Rosemary leaf extract, Tocopherol, Sunflower seed oil, Soybean oil, Canola oil, vegetable oil. First of all, you can't miss the waxes in the ingredients list, so essentially, the Burt's Bees Lemon Butter Cuticle Cream is a balm. It smells strongly of lemon/lemon peel - sweet and citrusy. It's hard to dislike the scent, really. 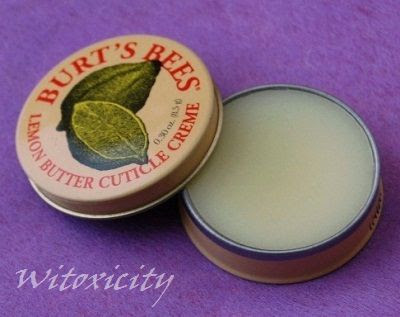 The balm is on the 'drier' side (less oily) and the consistency is harder (more solid) than say, the softer Burt's Bees Hand Salve (reviewed here). Instead of rubbing a finger on the surface to get to the balm, I tend to extract the balm with the back/top of my (clean) fingernail. In other words, I scrape the balm backwards with my fingernail. That way, I start off having the balm on one nail, dot each nail/cuticle of one hand with a bit of the balm and then, rub in with the nails/cuticles/minor knuckles of the other hand. I concentrate only on the nails and cuticles and don't tend to use the balm on the palm-side of the fingers. For each use, I need only about half a pea-size amount. Give it some 10 minutes. 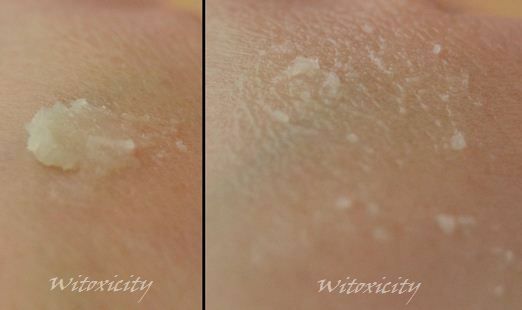 The oils will sink into the skin around the nails but you will still be left with tacky skin and nails. That's from the waxes. 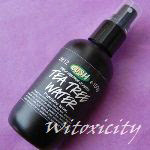 It's great for use after removing polish from the nails as that's when the nails are driest. After using an acetone-free nail polish remover, I would give my hands a quick wash with soap and water, and then proceed to apply this Burt's Bees Lemon Butter Cuticle Cream / balm. I would leave it on for several hours and let the oils re-nourish my dry nails and cuticles. As you know, lemon oil is especially great to keep nails healthy. The balm also works well to soften hardened skin around the nails (speaking from experience). I would call it a rescue balm for troubled cuticles. If used regularly, it would keep nails and cuticles in good condition. I'll have to agree with the general consensus. Highly recommended! Note: For my nails and cuticles, I don't use this Cuticle Cream exclusively, as I rotate it with the Burt's Bees Hand Salve and any of the MuLondon organic moisturisers that I happen to have in my stash. The regular-size tin (0.60oz / 17g) goes for around USD6.00. I've seen various prices here in the Netherlands. 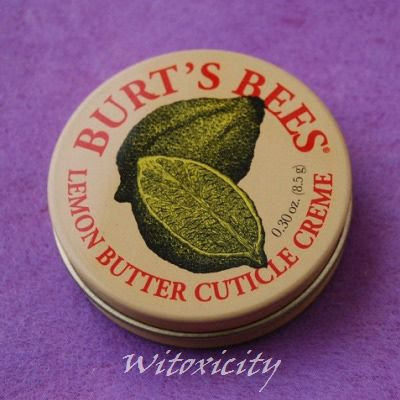 The Lemon Butter Cuticle Cream is also available in a Tin Trio, packed with a lipbalm and a hand cream. I've seen this trio going for between around €13 and €15. In the Netherlands, a limited selection of Burt's Bees products are available at, inter alia, Sephora, De Tuinen and one or two Etos stores. I can't believe you guys are just getting this. The Cuticle Lemon Butter is a must have. It really helps cuticles and nails. I alos rotate products. I haven't tried the hand salve yet though. It's a great balm for sure and the price can be a bit prohibitive. You might want to try the Burt's Bees Hand Salve instead (provided you can tolerate the scent of eucalyptus oil). The Hand Salve comes in a much much bigger tin for around €11 and you will get many months' use from it. Also, Sephora and De Tuinen offer discounts on Burt's Bees sometimes, so it would be good to look out for that. After reading your review on the hand salve I purchased myself one. Now after reading this post I think I will give this one a try too. Oh, I hope you like the Hand Salve! Pretty strong eucalyptus oil scent, eh?